Private equity–the world of the rich, the world of the brave. How can you become a player? How can you get into one of the investment companies? And how to succeed in the job interview with them? To be honest, the easiest way (and also the most common one) leads through a personal referral. Someone knows your qualities, they recommend you to the management of the company. You will still have to pass the interview, but you won’t be just another person from the street. 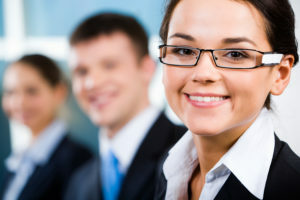 Such an interview is mostly about demonstrating your experience in the field (with the help of your resume and projects you’ve worked on before), and about building a good connection with the decision makers. Another great way of “getting in” lies in being headhunted for the job. 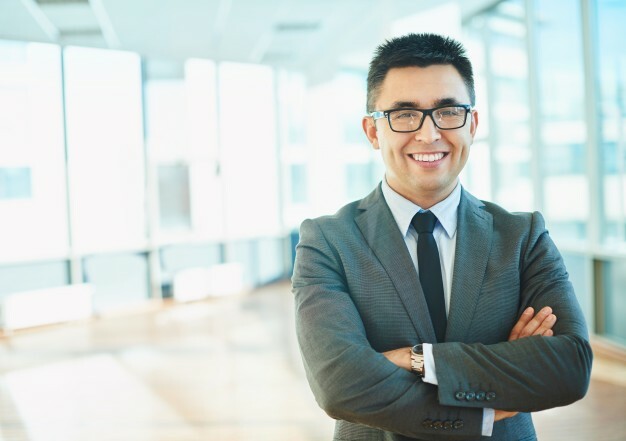 Needless to say, this option is completely out of your control, and you can only hope that someone spots you in the crowd, recognizes your achievements, and approaches you with a great job offer. Let’s have a look at options that are under your control. Private equity firms do actually advertise some job openings. The truth is that not every company can afford to use the services of a headhunter, and some companies prefer to cover the hiring process on their own. They will advertise a vacancy, collect the applications, and invite some people for the interviews. What will happen in the interview in this case? The interviews will typically consist in a few rounds. A phone interview with an HR person from the company (or a recruitment agency that does the initial screening of job applicants for them), a face to face meeting with one of the senior associates (or with the HR manager, if the branch employs one), and a final meeting with a director (often accompanied by an HR person, and some senior associates from the company). 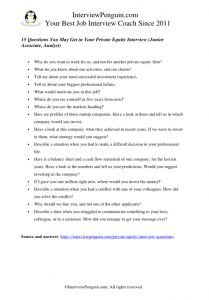 Below you will find a list of common questions for these interviews (all three rounds of them). * Check also Phone interview tips, to learn how to make a good impression on the call. Why do you want to work for us, and not for another private equity firm? You should do your homework. Research about the company, about their recent investments, goals and visions. Find something that resonates with you, and point it out. Praise them for something they do well, and show them that you did not apply for a job with them by a chance. What do you know about our activities, and our clients? Another opportunity to show that you did your homework. Speak about their activities with enthusiasm, and try to suggest how you’d help them to achieve their goals. The more you know about them, the better your chances of succeeding will be. Tell me about your most successful investment experience. Tell us about your biggest professional failure. Failures belong to life of every single investor. Tell them about a bad decision you made, one that cost you a lot of money, or even your reputation, or even your job. Your attitude matters the most for the interviewers. Show them that you can admit making a mistake, and that you actually learn from your failures, and that they help you to become better in what you do. What would motivate you in this job? Obviously the financial compensation is amazing in this sector. And while I’d not recommend talking about money in most job interview, I’d recommend that in this one. It is a tough field, and people who are driven by money are typically the people who do well in private equity. Nevertheless, you can go for another motives, such as your passion for investing, an option to transform existing companies, and other reasons that motivate you to work in the field. Where do you see the markets heading? Try to be bold in your predictions. Do not say what everyone else is saying. Point out certain opportunities you see on the market. Show them that you watch the trends, but think outside of the box. Here are profiles of three startup companies. Have a look at them and tell us in which company would you invest. Be aware of the pitfalls. All profiles may report some flaws, and there may be no clear winner. Or, a best answer can be that you won’t invest in any of the companies. Study the materials carefully, and try to explain your reasons. In private equity it is often hard to tell what a good investment is, since we do not know how things will pan out… Therefor the key is to show them that you can do some analysis, and have your reasons for investing, or for not investing in something. Have a look at this company, what they achieved in recent years. If we were to invest in them, what strategy would you suggest? Describe a situation when you had to make a difficult decision in your professional life. Decisions. Life of an investor is all about making decisions, and a bad one can sometimes cost the company millions of dollars. In your answer you should clearly explain the variables you considered before you made the final decision, and you should also ensure the interviewers that you are not afraid of making a decision. Here is a balance sheet and a cash flow statement of one company, for the last ten years. Have a look at the numbers and tell us your predictions. Would you suggest investing in the company? If I gave you one million right now, where would you invest the money? You have a few options at this point. One of them is going for diversification, saying that you do not like to put all eggs in one basket, and would invest in a variety of stocks/opportunities. Another alternative consists in going for a risk, saying you’d invest in a certain company or stock, trying to maximize the profit. The right answer depends a lot on the philosophy of the private equity firm, the type of investments they prefer, and they risk aversion ratio. Describe a situation when you had a conflict with one of your colleagues. How did you solve the conflict? Why should we hire you, and not one of the other applicants? This is not an easy question. Try to list your strengths, talk about the value you can bring to the company. If you have an ace hidden in your sleeve, this is the time to show your cards. Do you have good connections in the banks? Do you have some insider information? Do you know something other job candidates do not know? Do you have a special skill? This is the time to talk about such things. Unless they approach you directly (personal referral, headhunting), it is tough to ace this interview and get a job of your dreams. Our short selection of questions should help you to understand what to expect, in terms of personal, behavioral, and technical questions, including the short case studies. If you feel that you’d struggle with some of the questions, you should have a look at our Interview Success Package. Thank you for checking it out, we wish you good luck! InterviewPenguin.com – Your best job interview coach since 2011.